Our company’s namesake is a 1917 Port Huron Steam Traction Engine, a steam-powered tractor, that has been in the Brethorst family since the mid-1950s. Manufactured by the Port Huron Engine & Thresher Company in Port Huron, MI, this 22,000 pound behemoth still runs, drives and powers antique farm implements to this day. We show the engine at the Badger Steam & Gas Engine Club annual Steam Show every year. Brewery Chief Tanner Brethorst got into craft beer right around his 21st birthday. His dad, Dave, used to have a Friday night running club where everyone would try a new Wisconsin beer or two after the run. Over time, the running died out, but the beer sampling grew! Tanner was exposed to multitudes of great craft beer from around Wisconsin and beyond. While finishing his degree in Agricultural Business Management at the University of Wisconsin – Madison, Tanner was interested in seeing what a brewery job might entail. He landed a summer intern position at Tyranena Brewing Company in Lake Mills, WI. It was a tough, hot, sweaty job, but Tanner was hooked. After finishing his degree, Tanner decided to further his brewing education at the Siebel Institute in Chicago. He studied in both Chicago and in Munich, Germany and gained a wealth of knowledge along with his diploma. Following the Siebel stint, Tanner got a job with Lake Louie Brewing in Arena, WI, where he broadened his brewing chops for nearly four years. 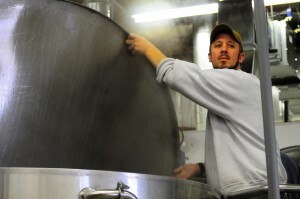 In 2008, a position opened up at Capital Brewery in Middleton, WI and Tanner was hired as a brewer for three years. In late 2010, a group of Tanner’s family came to him and persuaded him to follow his true dream of opening a brewery. On January 2nd, 2011, Port Huron Brewing Company began renovation in Wisconsin Dells. With many bumps and hiccups along the way, test batches were successfully brewed in late 2011 and beer for sale in kegs went out the door in mid-April 2012.